HR professionals are charged with keeping employees comfortable, productive, and engaged. As national politics increasingly distract employees from their work, some managers turn to policies or guidelines regarding political expression in the workplace to mitigate these issues. 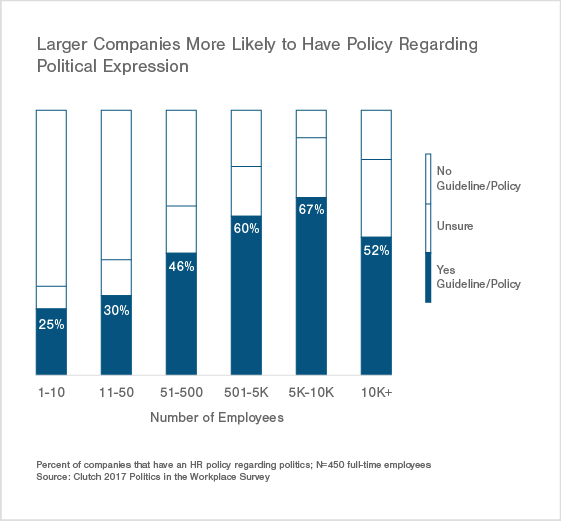 Clutch surveyed 1,000 full-time employees to better understand the benefits and drawbacks of developing a political expression policy. In an ideal world, employees will innately understand what is and is not appropriate to talk about at work, but every HR professional knows that reality is much more complicated. As political opinions become more and more partisan post the 2016 United States election, business managers and HR professionals may be forced to tackle issues concerning political expression in the workplace more frequently. In order to deal with politically-charged conflict, HR personnel need to first understand how their employees are affected by the changing political landscape and how that affects their work. To help HR professionals better manage political issues between employees, Clutch surveyed 1,000 full-time employees on their experience with company policies regarding political expression in the workplace. 12% of employees have been uncomfortable due to political expression at work in the last week, and 31% say their company’s productivity level has decreased as a result. 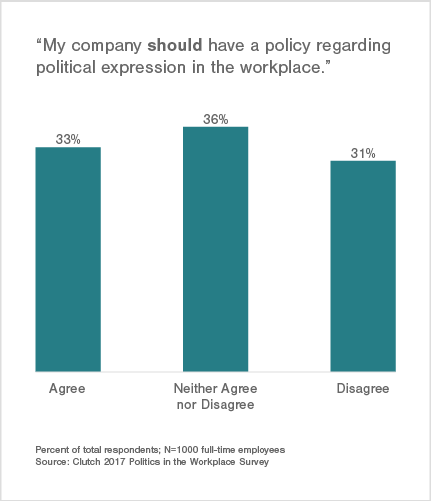 45% of companies have a guideline/policy regarding political expression in the workplace. Larger enterprises are more likely than small businesses to have a policy in place. 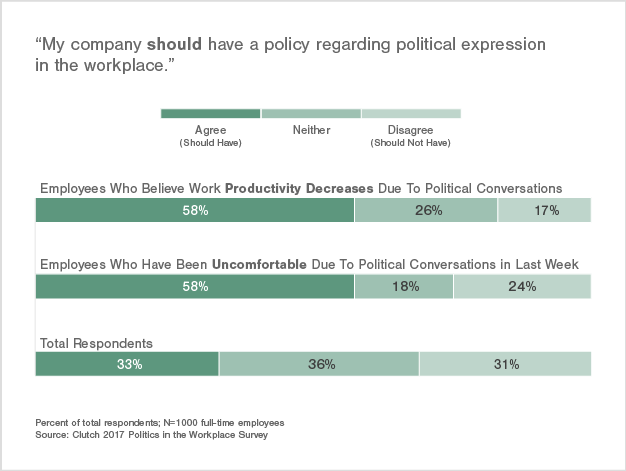 Over half of employees who have been uncomfortable or distracted by political expression at work believe their company should create a policy to address these issues. Employees who are negatively affected by political expression at work are more prevalent at companies where employees have diverse political views. HR experts recommend addressing the issue of political expression in the workplace with employees. However, there are many different ways a company can go about discouraging conflict, each with their own benefits and downsides. Regardless of whether a formal, written policy, or a brief, conversational approach is right for you, this issue should be considered and addressed by company leadership. Why are HR managers concerned about politics in the workplace? 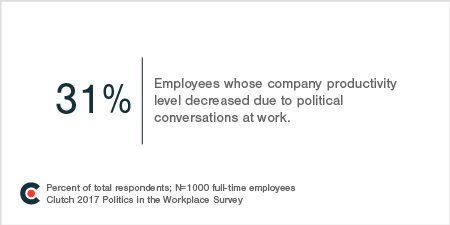 Nearly a third of employees agree that their company’s productivity level has decreased as a result of political conversations at work. Since the introduction of the 24-hour news cycle, the accessibility of politics online and on TV has never been greater. It is no wonder employees find it difficult to tune out the ever-evolving political landscape. Employees are distracted by politics well after the election cycle has ended. HR professionals and business managers are faced with increasingly distracted and unengaged employees, a trend which poses a serious threat to the bottom line. Not only are employees distracted by politics more now than ever, 12% report they have felt “uncomfortable” due to political expression at work in the last week. Though it is a relatively small percentage, 12% of employees can significantly affect the overall culture of a company. If more than one out of ten employees are made to feel like they do not belong, or their opinions are not being respected, a serious issue can arise for leaders attempting to create an honest, open, comfortable environment. HR managers are right to be concerned about the growing percentage of employees negatively affected (i.e. experienced discomfort, or distraction) by political conversations at work; if even one employee is experiencing difficulties interacting with their peers at work, it could be indicative of a larger culture issue. Why should HR managers consider developing a political expression policy? Many HR managers have turned to crafting policies or guidelines regarding political expression in the workplace in the hopes of deterring the negative effects the election cycle has had on employee productivity and comfort. In deciding whether or not to develop a policy, it helps to understand what kinds of companies already have one. 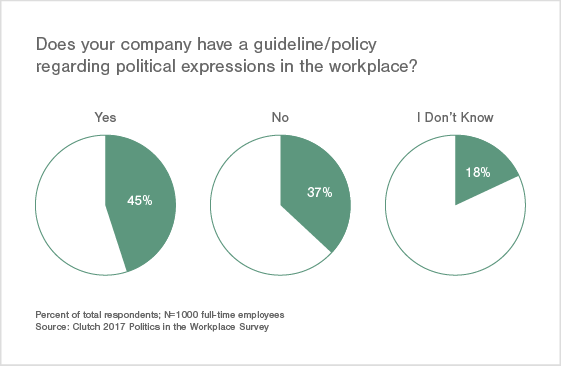 Overall, 45% of employees say their company has a policy or guideline regarding political expression in the workplace. More companies have a policy than those that do not. This finding is consistent with a recent survey by SHRM(Society of Human Resources), the world's largest professional association dedicated to HR, and shows that while many HR managers have decided to address this issue with a policy, others are less certain, or have gone another route. Large enterprises more commonly face lawsuits over discrimination and unionization than small businesses. Large enterprises bring together more employees – a larger number of opinions that might clash with each other. Small business leaders are able to interact 1 on 1 with employees more readily than leaders at large companies can, often catching disagreements before a formal policy is necessary. Larger companies have access to more resources to devote to developing a policy and hiring HR personnel to carry out a policy. The more ideologically diverse a company is, the more likely issues surrounding political conversations are to arise, and the more likely a company is to need a policy or guideline. 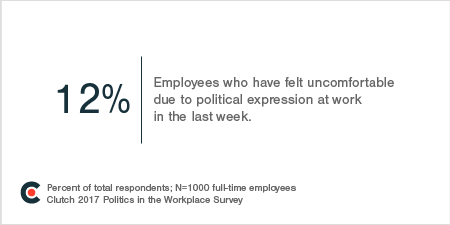 For employees whose views align, only 9% have felt uncomfortable because of political expression in the last week. Conversely, more than twice that number (23%) of employees have felt uncomfortable talking about politics at work with coworkers whose views do not align with their own. For larger companies attempting to create a culture of ideologically diverse employees, it may be wise to develop a policy regarding political expression as a way to prevent unnecessary or heated conflict between employees. One major bonus to creating a policy is that when employees feel more comfortable speaking their minds, a company is able to cultivate a more diverse, open culture. According to employees who have either felt uncomfortable due to political conversations in the last week, or believe that their company’s productivity level has decreased as a result of politics, a majority also believe their company should develop a policy addressing the issue. 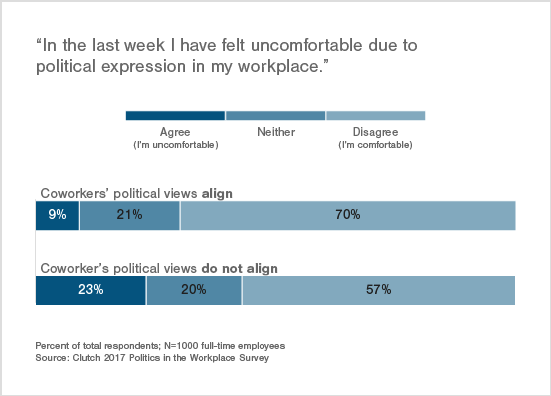 Respondents who have been negatively affected by political expression in the last week are almost twice as likely to want a company policy regulating politics in the workplace than total respondents. In order to help the employees who have been negatively affected by political expression at work in the past, business managers should consider developing a guideline to show those employees that leadership is concerned with their well-being and comfort, and to prevent future instances of political unrest. Policies and guidelines are able to communicate clear boundaries to employees on what is and is not appropriate to discuss while in the workplace. Boundaries are able to help marginalized employees feel confident voicing concerns and discomfort surrounding political expression to management; knowing that leadership will be responsive to employee frustrations is one comfort a policy offers. Luckily, helping marginalized employees feel comfortable in the workplace does not necessarily mean overhauling existing policies or implementing massive changes to the company culture. Policies aimed at curtailing political expression or redefining political conversations come in many forms. Unfortunately for managers looking for an easy fix to political disputes in their office, there is no “one size fits all” policy. Policies regarding political expression range from informal, conversational guidelines that are implemented through quick announcements at company meetings, to more formalized, structured policies that are established in an employee handbook. Formal, strict policies advise employers to add a written section regarding political expression in standing employee documentation. These polices include things like monitoring employee social media accounts, or limiting an employee’s ability to publically engage with politics in campaigns, protests, or rally’s in their spare time. Many HR professionals have turned to less formal policies that address general behavioral standards in the hopes of not offending employees who would rather not have a policy, while still protecting those who do. Guidelines aimed at cultivating a culture of respect and consideration will likely be more successful, and better received, than strict policies. Why should HR not develop a political policy? While there is conflicting advice from HR experts on what type of policy is most beneficial to adopt, for many businesses in the United States the answer will be none. One major drawback to implementing any policy affecting employee expression is enforcement. It is nearly impossible, and completely impractical to monitor employee conversations to ensure they are following a policy’s rules. Another major issue with implementing a policy regarding political expression is the potentially negative response from employees on the subject. Employees are almost perfectly split when it comes to whether or not they believe that their company should have a policy or guideline. Unfortunately for managers, there is not an overwhelming consensus from employees that a policy is for the best. This disagreement creates a number of potential problems for HR personnel: by implementing a policy to protect some from feeling ostracized, or uncomfortable, they may anger employees who feel like their rights are being infringed upon. Forcing some employees to abide by a policy they don’t agree with could have a negative impact on larger company culture. Fostering an environment of openness and feedback is difficult if employees feel like they are not allowed to express themselves fully. For employees who have never experienced a negative reaction to political discussions in the workplace, and may even thoroughly enjoy discussing politics at work, a policy restricting those rights could actually hurt company culture rather than nurture it. Arguably the largest barrier to crafting a policy are the legal issues that arise when an employer tries to limit expression. Before HR managers can assess whether a policy will benefit their work environment, they first need to consider whether or not the proposed policy is even legal. Clutch spoke with labor and employment lawyer David Miklas to help us better understand the different issues at work when discussing policies and guidelines regarding politics. For public employees, it is a much more difficult question because the first amendment may protect employees who work for a public employer, such as a teacher or government employee. However, for HR managers working in the private sector, although the first Amendment may not apply, the fine line between what is and is not acceptable policy-making is still hard to distinguish. Private employers are given broad rights to set company standards like appropriate work attire and behavior. While employers, especially those in “right to work” states, have the right to mandate political behavior, employees are simultaneously shielded by the NLRA, National Labor Relations Act, a piece of legislation that protects unionization. The NLRA requires employers to allow for discussions pertaining to wages, hours, leadership, and other topics related to labor rights that could be political in nature. For example, if employees want to talk about a politician who is proposing policy that affects their wages, they have the right to do so. The NLRA stipulates that few company guidelines are able to restrict one part of political discussion without restricting all conversation. Another way political expression policies potentially open up an employer to lawsuits is through discrimination and civil rights protections. Because political beliefs are often tied to personal minority statuses, there is a possibility that a haphazardly enforced policy will discriminate against particular groups of employees more than others. Attempting to craft a policy regarding political expression can be difficult because of these confounding legal issues. No matter where a company is in the process, they should consult legal counsel to ensure nothing has crossed a line before implementing their policy. Where does this leave HR professionals? The legal issues surrounding implementing a policy can be discouragement enough to prevent many businesses from addressing political expression in the workplace. However, experts recommend that at least casually addressing political expression in the workplace is a must, regardless of whether or not a policy is right for your company. Policies and guidelines, even very basic ones, are able to prevent unnecessary bias and tension between employees. While implementing a policy may upset the 31% of employees who believe their company should not have one, there are ways to set a standard for company culture without stepping on toes. Indeed, all companies should provide at least some minimal nod toward political expression with their employees in order to create a respectful and productive environment. Does your company have a large number of employees? If so, a policy may help keep all of the teams and divisions on the same page regarding political expression and the potential disciplinary actions associated with not abiding by standards. Are your employees diverse ideologically? If so, there is an increased chance of political disagreements, and an increased need for a policy outlining what is and is not okay political expression at work. Have your employees expressed concern? If there has already been expressed discomfort because of political conversations, a policy is likely to help company culture. If not, it may not make sense to introduce a policy out of the blue that may be contentious. Have you consulted your legal counsel? Any policy, informal or formal, should be looked over by a trained labor and employment attorney to ensure it is legal and enforceable. Clutch surveyed 1,000 full-time employees to evaluate their experience with political expression in the workplace and company policies affecting political expression. 48% of respondents work at companies with fewer than 200 employees, while 52% work at companies with 201-10,000+ employees. Amelia Peacock is a content developer and marketer at Clutch, a B2B research firm in the heart of Washington, DC. 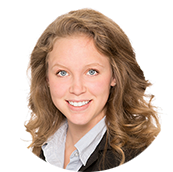 Her research focuses on human resources topics, business intelligence, and web design. Reach out with questions, comments, or concerns at [email protected].